Learn how to make a blueberry pie recipe; it can be made from fresh, frozen or canned blueberries. When blueberries are in season, around here from late May to Late Fall, they make great fresh blueberry desserts. 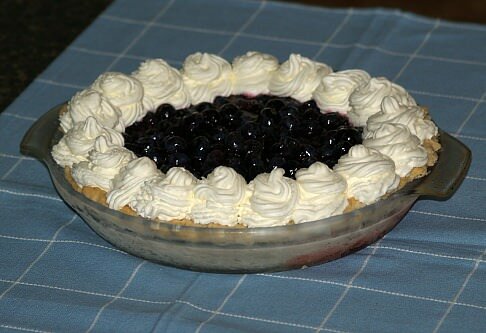 If you love to make pies, I am sure you found the blueberry pie is among the favorite of fresh berries. In some areas blueberries can be picked from wild bushes. Blueberry production in North America starts in Florida in the middle of May and ends in other states in the fall. The berries are readily available to us in the supermarkets to use in our blueberry desserts most of year. When I learned how to make the blueberry pie recipe, I used the excuse for eating them that the blueberries have so many health benefits. They are high in antioxidants and help prevent cancers. Some researchers claim eating blueberries will help to delay aging. Other claims are of reducing urinary tract infections and protecting against heart disease. This is a traditional blueberry pie recipe. Prepare crust recipe for double crust; divide dough in half. Roll half out slightly larger than pie pan. Fit and press into bottom of 9 inch pan; set aside. Combine blueberries, orange juice, lemon peel, salt, nutmeg and cinnamon in large saucepan. Combine cornstarch and sugar; stir into blueberry mixture. Cook and stir on medium heat until thickened and clear; add vanilla and almond. Pour into unbaked pie shell; dot with butter. Trim excess dough around pie pan; moisten pastry edge with water. Lift rolled dough onto filled pie; trim and crimp pie rim. Brush top with milk; place cut outs between vents and brush cutouts with milk. Cut foil out to cover only the rim of the pie to prevent over browning. Bake at 425F degrees for 10 minutes; reduce heat to 400F degrees and bake 30 minutes. Remove foil and bake 5 minutes longer or until crust is golden brown. 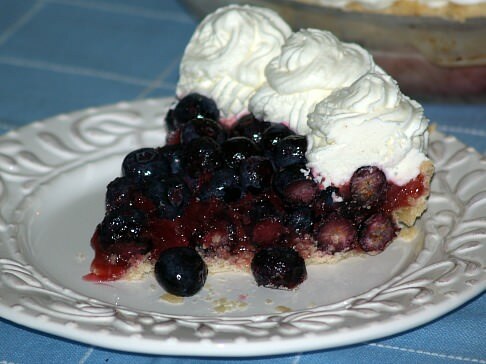 I learned how to make this blueberry pie recipe and found it so delicious and easy to make. Mix sugar, cornstarch and water. Blend well and bring to a boil over medium heat; cook until thickened. Add gelatin and stir well to blend. Remove from heat. Add blueberries, stir and pour into baked pie crust. Refrigerate until set and serve with whipped cream. Scald 1 cup milk over boiling water. Mix sugar, salt, flour and remaining ½ cup of milk, stirring until well blended. Stir into hot milk and cook slowly until thickened, stirring constantly. Cover and cook over boiling water for 5 minutes. Add mixture slowly to egg yolks and cook one minute longer. Add butter and vanilla. Cool and pour into pie shell. Top with drained blueberries; then top with the whipped cream. Top whipped cream with additional blueberries. Here are recipes to make Crisco’s single crust, 8-9 inch double crust and 10 inch double crust for your pie recipes. Measure flour and combine with salt; cut in shortening until crumbly. Sprinkle in water to form a dough ball; roll out on lightly floured surface. Preheat to 375F degrees; thaw all berries. Pour berries and all the juice in large bowl. In separate bowl combine and mix sugar, salt and cornstarch; pour on top of berries. Mix well with rubber spatula; fill both crusts and top with crusts. Trim dough and crimp edges; bake 45 to 60 minutes until golden brown. NOTE: I set tray under pies while baking to catch any spillovers. TO PREPARE PIE CRUST place 1 cup of flour in mixing bowl; cut in butter and shortening. Mix in enough ice water to hold dough together; wrap dough in plastic wrap and refrigerate 1 hour. Roll out dough and place in 9 inch pie plate; flute edges. Sprinkle bottom of pie crust lightly with tapioca; set aside. TO PREPARE FILLING mix together blueberries, apples, and lemon juice. Stir into fruit mixture 1 ½ tablespoons of flour, cornstarch, cinnamon and nutmeg. Place blueberry mixture in prepared pie crust. TO PREPARE TOPPING mix together 1/3 cup sugar, 1/3 cup flour, walnuts and 2 tablespoons butter. Sprinkle mixture over the pie filling; bake 45 to 50 minutes until the berries bubble. In a small bowl beat cream cheese, sugar and lemon peel until mfluffy; fold in whipped cream. Spoon into cooled pie shell; spread evenly. Spread blueberry filling over cream cheese filling; refrigerate at least 1 hour before serving. Garnish with dollops of whipped cream and strawberry fans; serves 8. Line a pie plate (9 inch) with pastry. Combine blueberries, 1 cup sugar, tapioca, salt and cinnamon in a bowl. Place mixture in prepared pie shell. In a bowl combine remaining 2 tablespoon sugar and lemon juice; sprinkle over the filling. Cover filling with remaining rolled dough; cut slits in top for steam vents. Trim dough and pinch to seal; bake for 45 minutes.